This recipe comes to you by way of two degrees of inspiration. 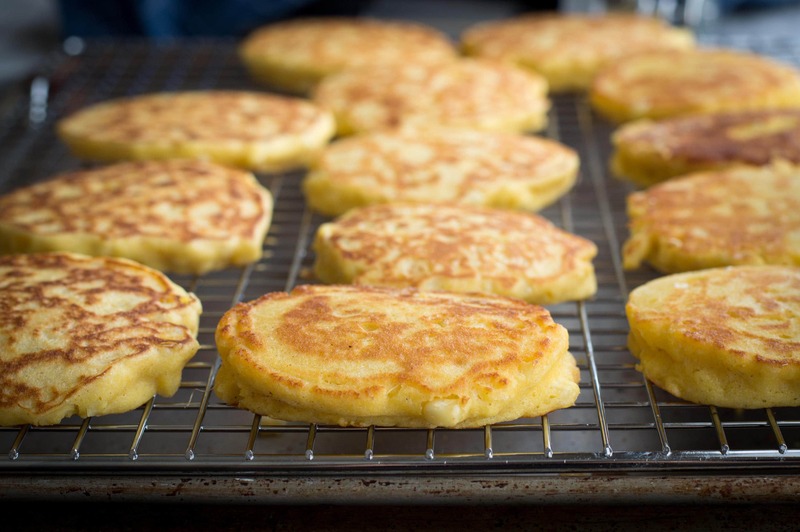 Last summer, David Lebovitz posted his adaptation of Alice Waters’ recipe for Fresh Corn Cakes, and I forgot to make them before corn season ended. They’ve drifted in and out of my consciousness ever since, and I’m so glad I finally whipped up a batch! Corn cakes pair equally well with sweet and savory toppings — serve them with maple syrup or honey butter for breakfast, or bring a basket to the dinner table in lieu of biscuits or cornbread. You can even make a killer twist on eggs benedict with corn cakes as the base, topped with ham, sliced tomatoes, poached eggs, and a ladle of hollandaise. 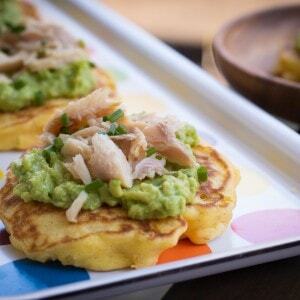 Here, I’ve topped the corn cakes with two of my favorite ingredients — flavorful flakes of smoked trout sit atop a generous smash of lemony avocado. Sprinkled with chopped chives, these make a perfect appetizer for a summer dinner. 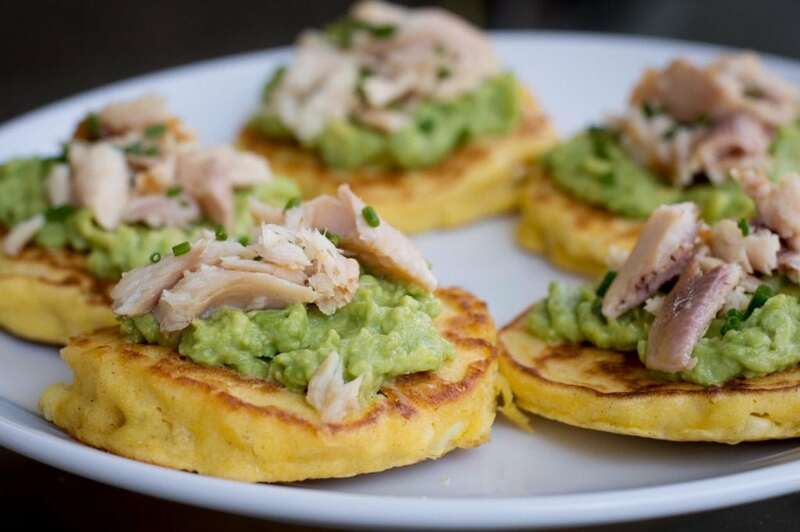 My rendition of Alice Waters' Fresh Corn Cakes, topped with lemony avocado and flaked smoked trout. In a large mixing bowl, whisk together the corn flour, baking powder, and salt. Set aside. In a small mixing bowl, microwave the butter, milk, and honey just until the butter has melted, about 1 minute. Stir and set aside to cool to room temperature (this can be sped along by placing the bowl in an ice bath, whisking frequently to keep the butter from solidifying on the sides of the bowl). Make a well in the center of the large bowl of dry ingredients. Add the milk mixture and the two egg yolks to the well, along with the corn kernels. Stir with a wooden spoon to combine evenly. In a clean, dry medium mixing bowl, beat the egg whites until they form stiff peaks. Gently fold them into the large bowl of batter until just combined — it is fine if a few streaks of egg white remain. In a large (12-inch) skillet, heat two teaspoons of butter over medium heat. When the butter begins to foam and bubble (but has not begun to brown), ladle four evenly-spaced, 1/4-cup portions of batter into the skillet. Let cook until golden brown on the bottom and beginning to bubble round the edges, about 2 minutes. Flip and cook on the second side until browned and cooked through, about one more minute. Serve immediately or keep in a warm (200ºF oven) for up to an hour before serving. To serve: In a small mixing bowl, coarsely mash the avocado with the lemon zest and juice and salt. 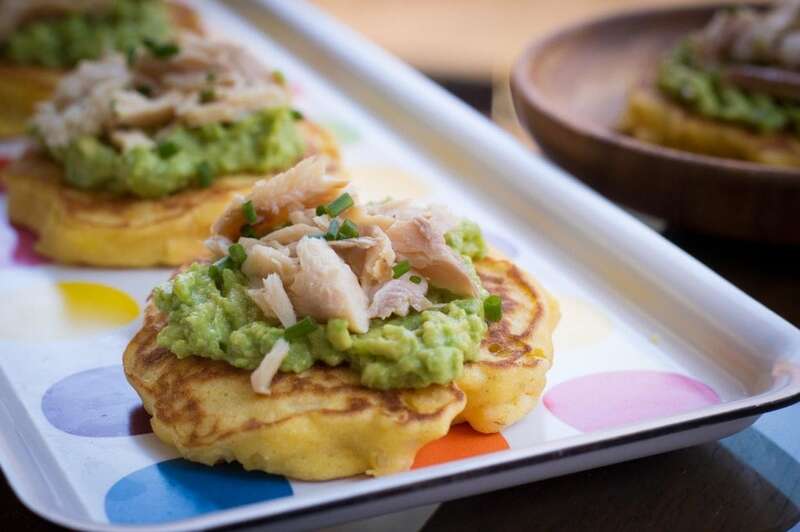 Spread a heaping tablespoon of avocado on each corn cake, then top with smoked trout and a sprinkle of chopped chives. Corn flour is different from corn meal, corn starch, or polenta — it’s basically a very finely ground corn meal. I purchased mine in a 24-ounce box at Whole Foods for $2.79, and have also seen it in bulk at Rainbow Foods and other well-stocked health food stores. For spicy corn cakes, add a chopped chili pepper to the batter along with the corn kernels. To make in advance, transfer corn cakes to a cooling rack directly after cooking and let cool to room temperature. Freeze in a single layer on a baking sheet, then store in freezer bags for up to one month. Toast lightly just before serving. Hi Julie — I hope you do make these, they’re delicious! When substituting flax for eggs, I follow the recipe from Angela at Oh She Glows, mixing 1 tablespoon of ground flax seeds with 3 tablespoons of water for the equivalent of one egg. Let the mixture thicken up a bit before adding it to the mix. For this recipe, which calls for two jumbo eggs + one white, I’d do 2 1/2 tablespoons of ground flax and 7 1/2 tablespoons (just under 1/2 cup) of water. The pancakes might not get as much lift as with eggs, though, as the flax will primarily work to bind the ingredients, rather than cause any rising action, so you can experiment with adding another teaspoon or so of baking powder to compensate if you like! Additionally, to make this recipe vegan, you’ll need to substitute agave, maple syrup, or brown rice syrup for the honey, and perhaps sub in a cup of coconut milk instead of regular milk, to make up for the richness of the egg yolks being left out. Let me know if you make a vegan variation!